Before Alexandria Marzano-Lesnevich begins a summer job at a law firm in Louisiana, working to help defend men accused of murder, she thinks her position is clear. The child of two lawyers, she is staunchly anti-death penalty. But the moment convicted murderer Ricky Langley's face flashes on the screen as she reviews old tapes-the moment she hears him speak of his crimes -- she is overcome with the feeling of wanting him to die. Shocked by her reaction, she digs deeper and deeper into the case. Despite their vastly different circumstances, something in his story is unsettlingly, uncannily familiar. 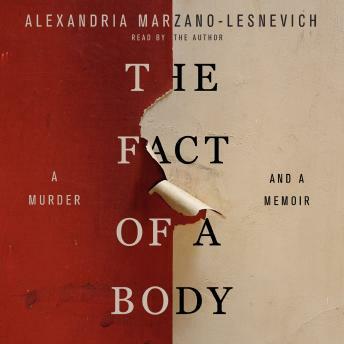 An intellectual and emotional thriller that is also a different kind of murder mystery, THE FACT OF A BODY is an audiobook not only about how the story of one crime was constructed -- but about how we grapple with our own personal histories. Along the way it tackles questions about the nature of forgiveness, and if a single narrative can ever really contain something as definitive as the truth. This groundbreaking, heart-stopping work, ten years in the making, shows how the law is more personal than we would like to believe -- and the truth more complicated, and powerful, than we could ever imagine. Painfully repetitive, which cause to lose interest to very painful and sad story. I thought the book was well written and I liked the way the author paralleled the stories of the subjects /characters and herself. I wasn't a fan of the narrator herself, though. No emotion in her voice. Although the story content was fascinating I found her voice causing me to lose interest in the story. Hard to hear but very insightful.